As we kick off the first full week of November, I’m reminded once again of how quickly time passes. As I get older (and my to-do list gets longer), I’ve come to see time as my most valuable commodity. It is the one thing I can never get back, and therefore, I strive to “spend” it as wisely as possible. In fact, this is why I focus so carefully on time management. This is why I place so much value in the mantra “work smarter and not harder.” And this is why I’m inspired to share what I learn with you – so that you can use your time well, too. No matter who we are, where we live, or what we do, we are all given 24 hours a day. When we learn how to make the most of that time, and we fill it with the things that bring us joy, we’ll discover that the life we want is waiting right here. So if you’re ready to start managing your time and making the most of your day, keep reading. 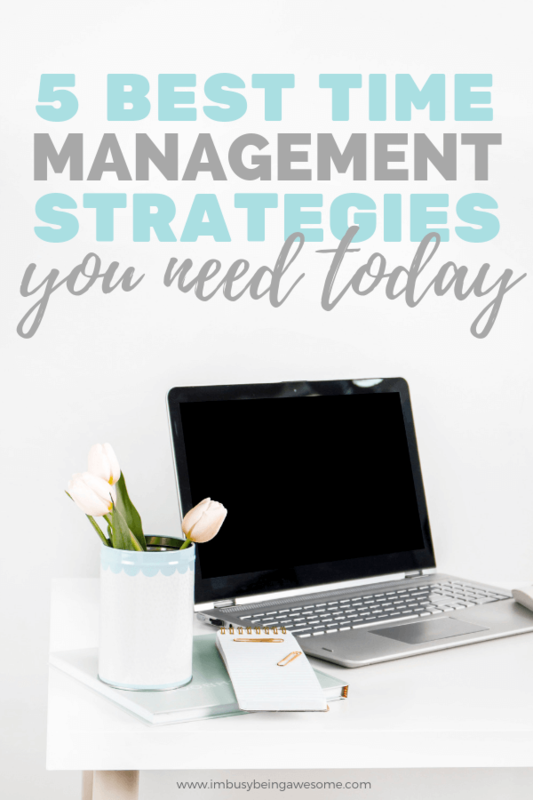 This post shares my five favorite strategies for effective time management. First of all, what it time management? Simply put, time management is planning how you divide your time between specific activities. Unfortunately, it’s easy to overlook (or ignore) this practice. We get overwhelmed by our to-do list, we convince ourselves that there’s no way to get it all done, and we fret over where to begin. By the end of the day, we’ve wasted our valuable time trying to “get organized” without ever moving forward. Does this sound familiar? Can you relate? If so, you’re in good company, friend. But here’s the good news. We don’t have to feel this unnecessary stress and anxiety around our to-do list. We don’t have to waste our time wondering where to start. Instead, we can spend a few minutes each day planning out our schedule, and then rock our to-do list with ease. You see, when we create a clear and concrete plan of how to spend our time, we don’t struggle with those feelings of overwhelm. We don’t worry about where to start, because the answer is right there in our planner. And rather than wasting time, we get to work. Sound like a good strategy? Excellent, then keep reading to discover my five favorite time management strategies. Let’s do this. Before the day begins, take some time to write down the top two or three most important tasks on which you need to work. What are the items on your to-do list that will move you closer to your goals? Write them on a sticky note (or in your planner) and then start working. If you complete those two or three tasks before the day ends, that’s great! Then you can move on to the other items on your to-do list. But until that time comes, stay focused on the big three. If you’ve been following I’m Busy Being Awesome for a while now, you know how I feel about the myth of multitasking. As alluring as the idea sounds, efficient multitasking is like a unicorn; it doesn’t exist. In fact, science continues to prove that our brains simply don’t work that way. So if you want to crush your to-do list and make the most of your time, the secret is in single-tasking. Look at the list you made in step one, choose the task on which you want to focus, and then get started. Don’t bounce from task to task, because you waste valuable energy in the transition time. Instead, turn off those distractions, turn on your white noise machine, and dive into the project. Do you want more tips on single-tasking? Check out my post here! Establishing clear deadlines for each task is another great way to manage your time. Deadlines help to keep you accountable, and they give you the boost of motivation you need to stay focused on the task at hand. If you struggle to hold yourself accountable to seemingly “arbitrary deadlines” that you set for yourself, then you might benefit from an accountability partner! Accountability partners are a great way to help you stay on track, manage your time, and rock your goals. If you’re looking for some extra accountability, then be sure to join the I’m Busy Being Awesome Facebook group. We help each other stay on track and work toward our goals every day. By setting clear goals for yourself, you automatically identify what should be “top priority” on your to-do list. When you know what you’re working toward, and you have that “end goal” in sight, it’s easier to stay focused on your objective. One of my favorite ways to set goals is with a goals pyramid, which is a simple and practical way to break down your big dreams into smaller steps. It takes away the intimidation by helping you identify actions you can take every single day to help you reach your goals. Plus, when you use a goals pyramid, it’s easier to recognize your consistent progress, which makes it much more motivating to continue working toward your goals. Want to learn more about using a goals pyramid? Check out this post here! This strategy is my all-time favorite when it comes to making the most of my day. What is time blocking, exactly? Simply put, time blocking is the practice of dividing your day into clear blocks of time. Then, you fit your to-do list into those windows. If you’re thinking this sounds pretty simple, you’re right. It is! And that’s one of the reasons I love it so much. I also love time blocking because it gets the ball rolling when you’re feeling overwhelmed by your to-do list. It keeps you focused when you’re feeling distracted. And it provides motivation when you’re ready to throw in the towel. I’m telling you, friends, time blocking is where it’s at. Look at your to-do list for the day. Decide how much time each task will take. Lay out your list on a time block template, allowing for short breaks in between to recharge. As you can see, this strategy is incredibly straightforward. There are a few different methods to the approach, however. So if you want to learn more, be sure to check out my post dedicated to all things time blocking here! 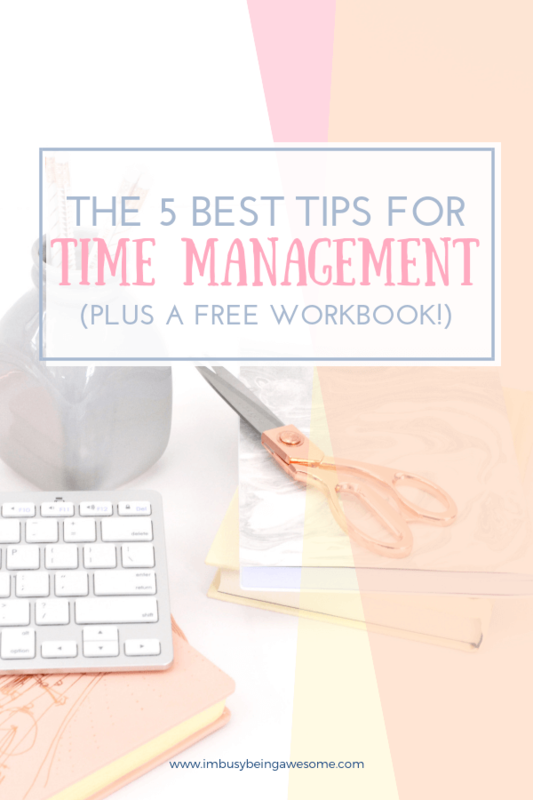 There you have it – my top 5 strategies for effective time management. Are you ready to start rocking your work day? Awesome! Then grab your free time blocking workbook here, choose your favorite strategies, and get to work. You’ve got this, friend. 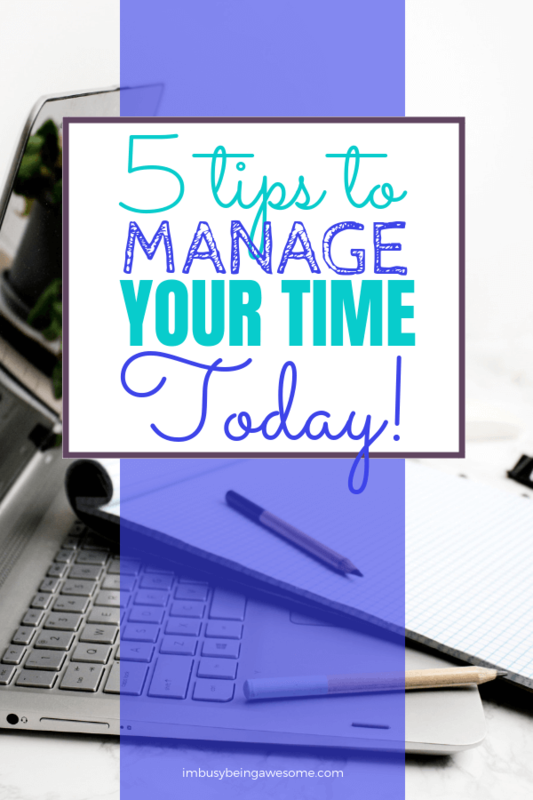 What are your favorite time management strategies? Let me know below! Your tips are so practical and make so much sense. Definitely putting these into practice as my to-do lists are getting overwhelming! It’s so true that time seems to go faster the older we get and it’s so precious. These tips are so helpful – my favourite is time blocking, it really boosts my productivity. I love time blocking, too! Deadlines are an absolute must for me! If I don’t set them, I continuously push everything back. Great tips! They’re such a big help, aren’t they? Time management is the one thing I struggle with daily. I’m going to try these tips for sure! Please let me know how it goes! You got this!! These are amazing tips Paula! I often practice number 1 and 5. I think writing things down and setting the timer for each of them helps a lot! I’ve come to adopt single-tasking here lately. When I focus my energy on one task, I do a much better job than when I’m spreading myself too thin with multiple tasks. YES! Single-tasking for the win! With the busy holiday season, I am already overwhelmed. Thanks for these great tips to help me stay on track! I love this! Establishing what your goals are is so important to getting anything done, really! I’ve been pickign my top three things lately and I really liek how that helps me get things off of my long term to do list. I’m so glad to hear it, Justine! These are all such great tips and many of them I use myself! I’ve been wanting to start implementing time blocking, but haven’t made the jump yet! These are the EXACT steps I try and take but sometimes you get ahead of yourself and lose focus. Thanks for bringing them back to my attention. Great tips. Single-tasking really helps me. Helps eliminate anxiety from the “rest” of the list. Thanks for sharing. Time management is always the key to a less stressful life! 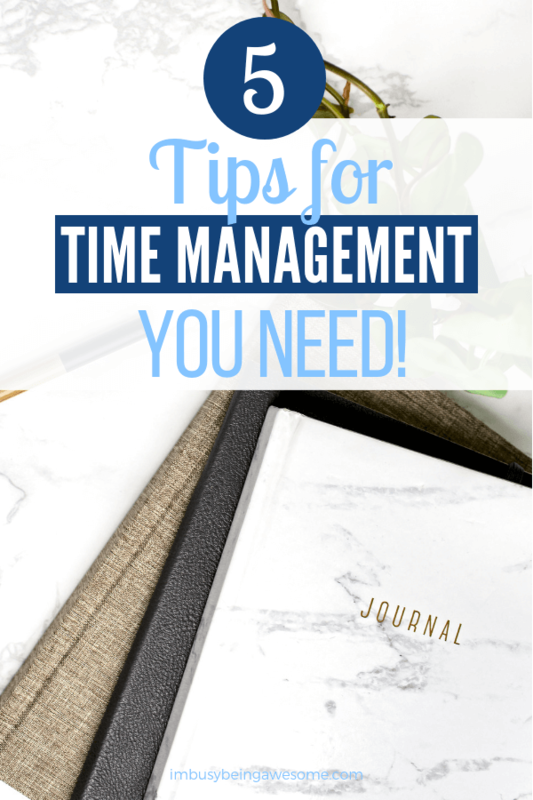 I personally struggle from time management as i juggle two jobs at the same time but this post is really helpful moving forward! Thanks for these great tips! I’m great at using my time wisely when the kids are at school, but once they are home, it’s a massive challenge. 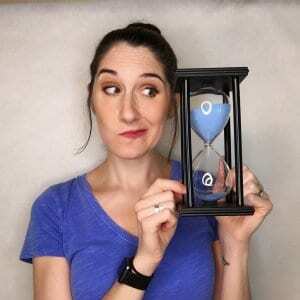 I love time blocking too because it helps me keep the focus more in the moment, though this only works when I get time to work alone without kids around.Thanks for these tips, I will try them out. Let me know if they help, Julie! I’m all about working smarter, not harder. Although sometimes I don’t necessarily do that. I need to focus more on single tasking and setting deadlines. If I have a hard deadline, I meet it. I just need to start treating the deadlines I set for myself as hard deadlines, and it will help a lot with my time management! Agreed! Deadlines are such a great way to get us moving, aren’t they? I realllllly need to start time blocking. I used to be so great at managing my time, but now I just feel like I’m always doing a milion things at once. Ah!! Such a good post at the right timing for me with recently graduating college, working and now engaged!! Ugh thank you! Great post. I’ll definitely try to incorporate some of these into my routine, because I’m definitely guilty of not being able to manage my time well. I think I am the worst at unintentional multi-tasking, haha. Meaning that I tend to get distracted and drift between tasks instead of focusing on one meaningfully! I like the idea of tuning out noise and distractions and just focusing on one big thing at a time! I love time blocking! It really helps me accomplish my ambitious to-do list. I set a timer on my phone to keep me on track. I love the phone timer suggestion; great tip, Christa. Thank you! I need this! In general, I feel like I’m terrible at time management. I love the idea of picking 2 or 3 items each day. I think that would help me so much. I usually end up getting overwhelmed by my list and accomplishing nothing. Trying this today! It’s SO easy to get overwhelmed by our to-do lists, isn’t it? I hope focusing on just 2-3 things helps! These are such great tips! Time blocking is something I really need to start doing more of! Yes! I love these tips! There are just too many things to get done in a day and it’s so hard to prioritize. These tips are super helpful! Fantastic! I really need to work on #5! I definitely try to avoid multi-tasking as much as possible. I totally agree that it is less efficient! Love the idea of picking out two or three must-dos for the day. Makes the to-do list seem less daunting! Time management is definitely so important. I know that for me if I did not have a schedule I would lose my mind. I used to be so good at this until I started working from home with kids 😂 I love the time blocking suggestion and def trying it! Picking just two or three to start with is key. Sometimes I make a list of like 6 or more things and I obviously cannot achieve all of that in one day. I love your sticky note idea for attainable goals! As a mom of two I always feel like I need more time. I look forward to implementing some of your ideas.